London Festival of Architecture 2016: a month-long programme of events and installations begins in the UK capital next week. Dezeen architecture editor Amy Frearson has picked out the highlights. The London Festival of Architecture features over 200 events taking place across the capital. Curated by director Tamsie Thomson, this year's event is themed around communities, with topics ranging from guerilla gardening to creative workspaces. The refugee crisis is an ongoing challenge for designers, and is going to be one of the hottest topics during the Venice Architecture Biennale next week. 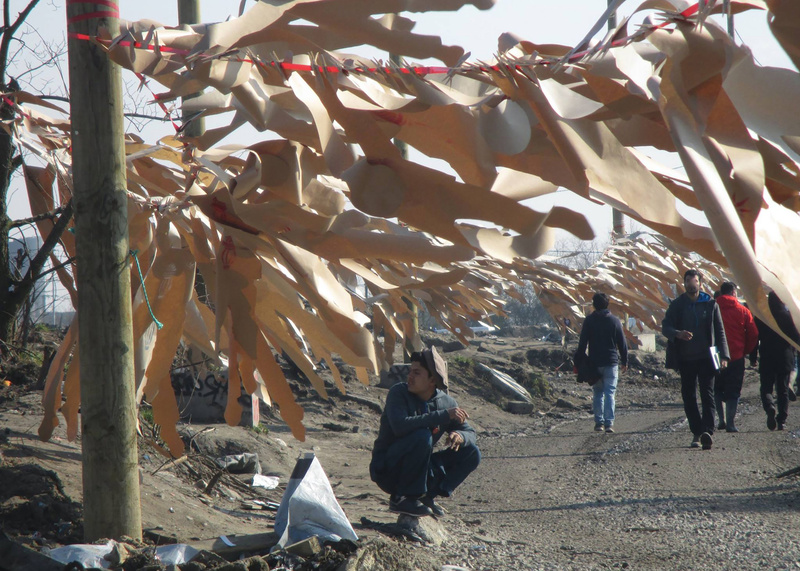 LFA will continue this debate with a one-day festival examining the creative culture that has emerged from refugee camps across Europe, and the lessons that can be learned from it. Curated by former Cass dean Robert Mull, the event is described as "part festival, part academic conference, part village fete" and will take place in partnership with London's Barbican. Participants also include the Worldwide Tribe charity, artist Alpha, architectural historian Joseph Rykwert, Syrian architect Marwa al-Sabouni, Grainne Hassett of the Calais Builds initiative and Architecture Foundation deputy director Phineas Harper. London has established itself as one of the pioneers of the co-living and co-working trends, which centre around the concept of communal spaces and shared resources. The implications of these trends for designers is the subject of a talk hosted by shared workspace company The Trampery. The event will feature a panel of architects and industry experts, and will examine how residences and offices can be adapted to suit new community-focused approaches to working and living. Similarly, Airbnb and Threefold Architects are co-hosting a talk about the changing role of the workplace, titled Belong Anywhere, while the Nunnery Gallery will hold a panel discussion about creating art studios, called Breaking Down Walls. French artist Olivier Grossetête – whose previous projects include a rope bridge held up by balloons – will be using hundreds of cardboard boxes to construct a series of full-size buildings in the Queen Elizabeth Olympic Park. On 25 June visitors are invited to help erect these make-shift structures, demonstrating what is possible through collective endeavour. Throughout June, the crescent outside New London Architecture will be transformed into a community garden promoting the benefits of urban farming. Led by landscape collective The Edible Bus Stop, the project will showcase a prototype for a modular growing system that could lead to more businesses around the city growing their own fruit and vegetables. The collective is also working with local residents and school children in southwest London to transform a market street into a community hub, with new seating areas integrated into white picket fences, and planters filled with edible flowers and herbs. Following a series of acclaimed housing projects in the capital, London studio Karakusevic Carson Architects invites visitors to an exhibition exploring how contemporary council housing can help to foster communities. The exhibition is part of the RIBA Open Studios strand of the London Festival of Architecture. The show will also form the backdrop to a day of talks and film screening, featuring both recently completed housing projects and historic precedents. Also as part of the RIBA's Open Studios initiative, architects office Studio Gil will be showcasing some of the events, installations and structures it has created as part of a long-running partnership with the Latin American community of Elephant and Castle, southeast London. These range from a new community hub to a public square. As well as an exhibition inside their office, the architects will be curating a programme of live installations with University of Brighton architecture students in East Street Market. The Royal Institute of British Architects ran a competition asking architects to look at how architecture can help build communities. The 16 longlisted entrants go on show at Peckham Levels – the car park that is being transformed into a hub for artists – while the three winners will build one-to-one installations at the RIBA headquarters at 66 Portland Place. Participants include De Rosee Sa, DH Liberty, Weston Williamson + Partners, Tate Harmer and Feilden Clegg Bradley. Taking place at the Fitzhugh Estate in Wandsworth, a 1950s housing estate designed by John Leslie Martin, this exhibition presents photographs and films looking at the relationship between British Modernism and social housing. One of the highlights will be a new collection of images by photographer Sharon O'Neill. Australian comedian Tim Ross and musician Kit Warhurst will be performing inside a series of architectural icons around London, in a bid to highlight the importance of engaging with architectural heritage. Venues include Ernö Goldfinger's Modernist house at 2 Willow Road, the BT Tower, Studio Octopi's White Lodge and the Australian High Commission. One of London's newest cultural facilities, the Black Cultural Archives, is teaming up with nonprofit collective Architects for Social Housing to provide a platform for unheard voices in the community. This will take the form of a tower constructed from recycled loudspeakers, which will broadcast opinions about political and social issues.